4 Hear, O Israel: The Lord our God, the Lord is one. [a] 5 Love the Lord your God with all your heart and with all your soul and with all your strength. 6 These commandments that I give you today are to be on your hearts. 7 Impress them on your children. Talk about them when you sit at home and when you walk along the road, when you lie down and when you get up. 8 Tie them as symbols on our hands and bind them on your foreheads. These verses are loaded with specific instructions for loving God and making His word a part of our daily routine. That can be a challenge when we are always on the go in my family. It's a tall order, figuring out how, exactly, to teach our kids about God so that His love can transform their hearts. It's a delicate balance. I want to inspire them with faith, not force it on them and send them running for the hills when I'm not looking. Highlighting a specific verse each month, though, is one small way God makes a huge impression on us. This is our Bible verse for this month (above). I recycled an old dry-erase board from our Goodwill pile. 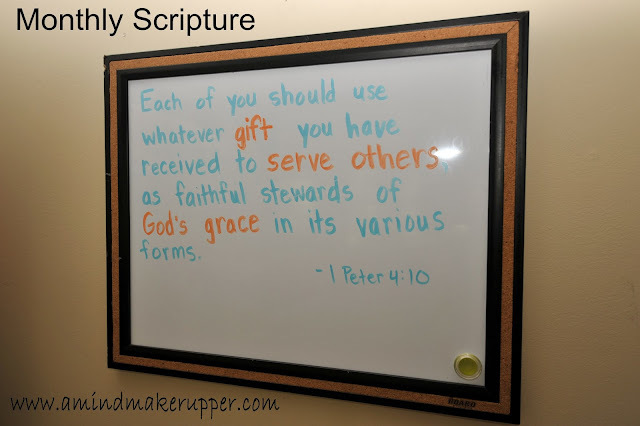 There are several details to our monthly Bible verse that are worth mentioning in making it work for our family, live and learn kind of details. Like any good idea, you have to take it and make it work for you. 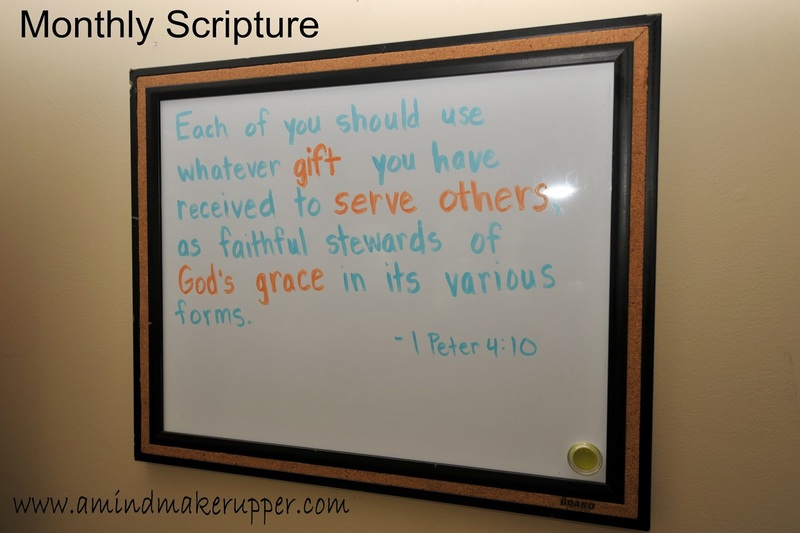 A popular, common area of your home works great for a monthly Bible verse. Our favorite room in our house? The kitchen, of course. I have three boys and a growing husband. So, I put our verse on a prominent wall in our kitchen right beside the refrigerator and in plain view of our kitchen table. If the people in your house are anything like the people (big and small) in mine, they go to the refrigerator not only when they are hungry and need to eat but when they are bored and don't have anything else to do. You know, the open the refrigerator door and just stare move? I figure, we are sure to see the verse morning, noon, and night if it's anywhere close to food! The monthly Bible verse has become a fantastic conversation starter in our house. (I think it's important to point out, we do NOT let the Bible verse become an opportunity for lecturing our kids on the do's and don'ts of life. They create plenty of opportunities for that on their own.) Because we see the Bible verse several times a day, usually around food, we end up talking about it during meal times. When I first put it up, we read it together. This is a great way to reinforce my kids' developing reading skills, along with growing their faith. We talk about what the verse really means, little bits at a time, and we share our own examples of the verse in our lives throughout the month. The verse also gives my husband and I (as grown-ups) chances to admit our short-comings to our kids aloud, so they can see areas where we need to change and grow. Trust me, they are all ears when we start talking about our own mistakes! I want my kids to know their parents are works in progress, too, so they aren't afraid to face their own weaknesses and mess-ups with God's grace. Originally, the monthly Bible verse was directed at our kids. I wanted to spark their interest in the Bible and help them become familiar with God's word as a resource and comfort in facing the ups, downs, and in-betweens life brings. It turns out, the monthly Bible verse is ALWAYS invaluable to us, the grown-ups, too. It's a great reminder that our faith is grounded in God's word and promises, full of mercy and grace, inspiring us to share God's love in our home and with others when we walk out the front door. Thank you for my friends and family, for new ways to grow my faith, and for opportunities to share your love with others. I pray for my family today. Lord, help me to know and love you. Help (name your family members) to know and love you, too. Heal and transform us as a family. May your love for us be our example and our inspiration for offering your mercy and grace to those in need. Excellent!! Very powerful. It would be awesome if more and more parents took the time to practice this. 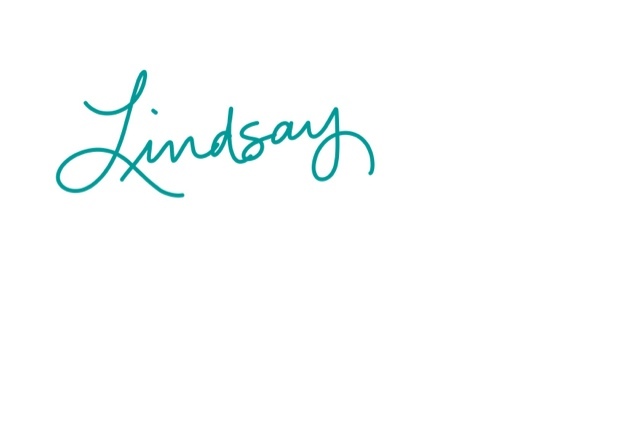 God bless you Lindsay.